I’ll sort out that long promised review of Ubuntu Hardy and take it from there. I was really enjoying playing with Arch and I’ll have to start again with another hard disk or machine. 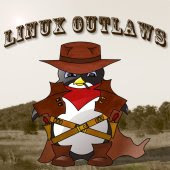 In the meantime if you want to hear my thoughts on anything Linux and open source related please check out the Linux Outlaws podcast which we have managed to keep going through the technical problems. We talk about open source news, new distro releases, reviews and much much more, all with some irreverent humour and light-hearted feel.